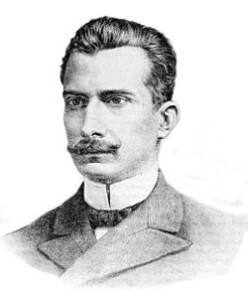 Luis Thayer Ojeda (1874-1942) was a Chilean historian, linguist and keen euhemerist. He spent a long time studying Mediterranean mythologies and concluded that classical mythology is nothing more than a poetic form of a nation’s history. He believed that many of the peoples of Europe, conventionally assumed to have arrived from the east, had in fact come from the west – from Atlantis. Thayer Ojeda also supported the concept of an isthmus at Gibraltar and produced a hypothetical map of the Mediterranean before the breaching of the landbridge. Alexander Braghine wrote enthusiastically about Thayer Ojeda’s work[156.144/7], recommending two of his books, which unfortunately are only available in Spanish.